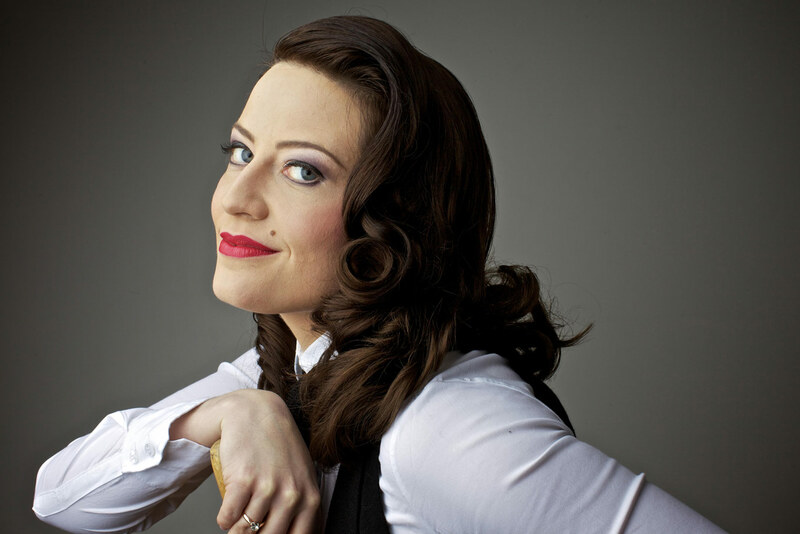 Mezzo-Soprano Hanna Hipp has a busy series of engagements and house debuts for the upcoming 2016⁄17 season. In August she makes her house debut at Seattle Opera as Isolier in Rossini’s Le comte Ory. She then returns to Scottish Opera for Cherubino in Le nozze di Figaro as well as a concert performance of the role of Beppe in Mascagni’s L’amico Fritz. In 2017 she will perform at the Royal Opera House, Covent Garden as Magdalene in a new production of Die Meistersinger von Nürnberg directed by Kasper Holten and conducted by Sir Antonio Pappano. She will then record the role of Anna in Les Troyens for the Erato and Warner Classics label. Ms Hipp will also make her house debut at Dutch National Opera in Amsterdam in Richard Strauss’s Salome as the Page. In the summer of 2017 she returns to the Glyndebourne Festival to sing the role of the Composer in Richard Strauss’ Ariadne auf Naxos. In the 2015-16 season Hanna Hipp made her role and house debut at Minnesota Opera singing the Composer in Ariadne auf Naxos. She also returned to her native Poland to sing Suzuki in Puccini’s Madame Butterfly at Teatr Wielki in Warsaw, a role she repeated at her house debut at Bergen Opera. Ms. Hipp appeared in concert with the Orchestre de la Suisse Romande in Geneva and Lausanne in performances of L’Enfant et les Sortilèges under Charles Dutoit. In the summer of 2016 she returned to the Glyndebourne Festival as Magdalene in Wagner’s Die Meistersinger von Nürnberg. Past season highlights include singing Ramiro in Mozart’s La Finta Giardiniera with Glyndebourne On Tour and making her house debut at Teatro alla Scala as Mercédès in Georges Bizet’s Carmen under Massimo Zanetti. After a role debut as Dorabella in Mozart’s Così fan tutte at Opéra de Limoges, she returned to the Glyndebourne Festival where she performed the roles of the Cat and the Squirrel in Ravel’s L’enfant et les sortilèges and covered the role of Concepción in Ravel’s L’heure espagnole in a Laurent Pelly production conducted by Robin Ticciati. Ms Hipp has made many recent role and house debuts, including with the Turku Music Festival in Finland, performing the role of Cherubino in Le nozze di Figaro, and Teatro dell’Opera di Roma in Ravel’s L’enfant et les sortilèges as Maman/Libellule/La Tasse Chinoise under Charles Dutoit. She made her house and role debut at the Scottish Opera as Suzuki in Madama Butterfly and the Glyndebourne Festival as Flora in La Traviata. She performed in several concerts and recitals, including recitals at Opéra de Lille and in London, the title part in Handel’s Solomon with the Oxford Bach Choir and London Mozart Players under Nicholas Cleobury at the Sheldonian Theatre in Oxford, Handel’s Messiah with the London Mozart Players at the Royal Festival Hall, London and with Classical Opera in London the role of Annio in La Clemenza di Tito. She also appeared in Strauss´ Elektra at the BBC Proms 2014 under the baton of Semyon Bychkov. She joined the Jette Parker Young Artists Programme at the Royal Opera House in September 2011. While there she performed Jean in Le Portrait de Manon by Massenet, and Les Nuits d’été by Berlioz, Flora and Annina in Verdi’s La traviata, Anna in Berlioz’ Les Troyens, Emilia in Otello, Modestina in Il viaggio a Reims by Rossini, Zweite Dame in Mozart’s Die Zauberflöte and Bianca in La rondine by Puccini. As a member of the programme she also covered the roles of Magdalene in Wagner’s Die Meistersinger von Nürnberg, Cherubino in Mozart´s Le nozze di Figaro, Olga in Tchaikovsky’s Eugene Onegin, Wellgunde in Wagner’s Das Rheingold and Götterdämmerung and Second Angel-Marie in Written on Skin by George Benjamin. Highlights of her time at Covent Garden include performing Emilia in Act IV of Verdi’s Otello in the Plácido Domingo Celebration, singing Anna in the BBC Proms presentation of Les Troyens in the Royal Albert Hall, and the release of her performance in Le Portrait de Manon and Les Nuits d’été on CD. Ms. Hipp is also an accomplished concert artist, who has performed at the Schleswig-Holstein Music Festival, the London Handel Festival and numerous twentieth-century music festivals in Europe. She studied at the Stanisław Moniuszko Academy of Music in Gdańsk (MA in Singing and Drama with distinction), the Guildhall School of Music & Drama (MMus in Performance), graduating from the Opera Course with distinction, and at the National Opera Studio in London. While still a student, she participated in various opera productions with great success including Orfeo in Gluck´s Orfeo ed Euridice, The Anne who Strips in Sallinen´s The King goes forth to France, Arina in The Marriage by Martinů, Aurelio in Donizetti´s L’assedio di Calais, and the title role in Massenet´s Chérubin. Other roles performed have included Lucilla in La scala di seta by Rossini and Marianna in Rossini’s Il Signor Bruschino, Poro in Hasse´s Cleofide and Amastris in Handel´s Serse.